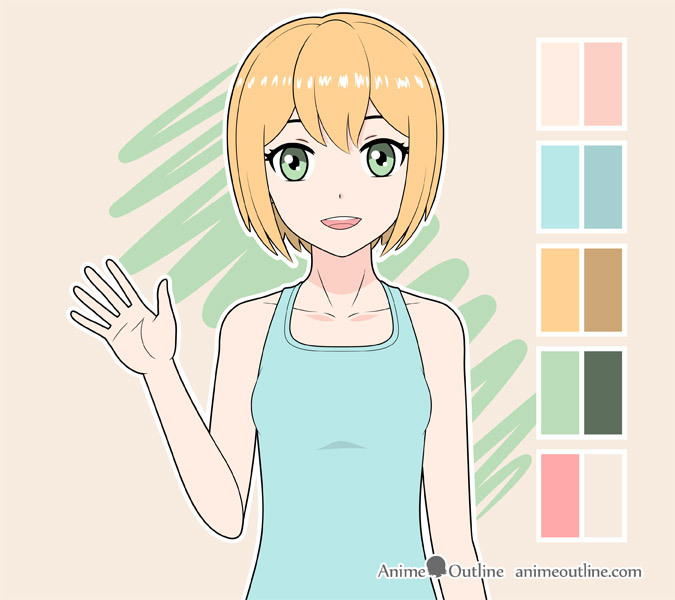 This beginner friendly tutorial explains how to color a character in the anime style with detailed step by step examples and explanations. 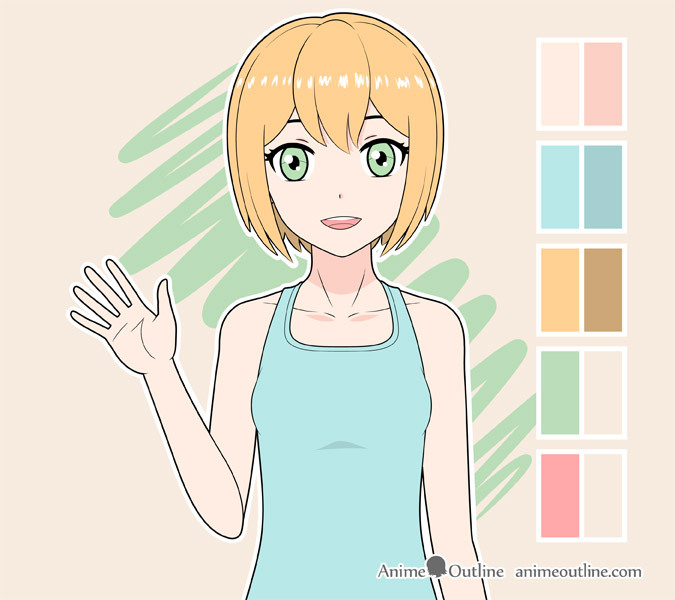 The coloring style used in anime is known as “Cel Shading”. 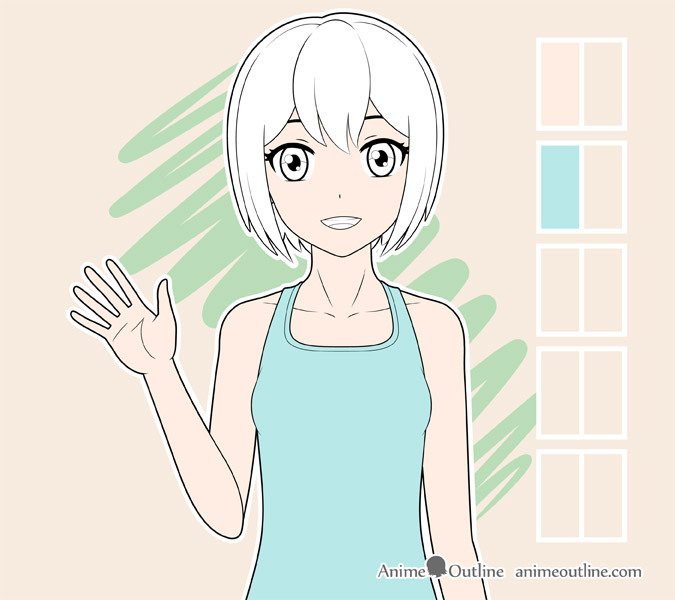 Cel shading is a technique generally used in animations and manga/comic book style art as well as 3d renderings where there are no gradients used between the shaded and normal areas. 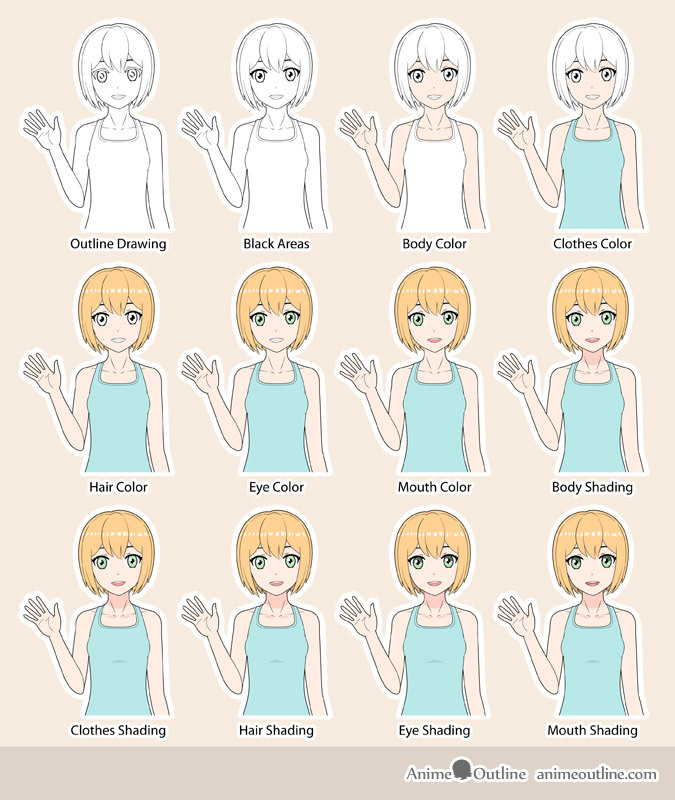 To keep this tutorial beginner friendly it will focus on applying the bare minimum shading generally used in anime in most normal lighting conditions. You can also apply the tips in this tutorial to drawing other anime characters. You can simply add more steps if you want to color a more complex character. When coloring and shading a drawing you want to start with the largest areas of the drawing first and work down to the smaller details. You will also want color in your whole drawing before applying the shadows. If you are going to be drawing on paper be sure to leave the highlighted areas white. 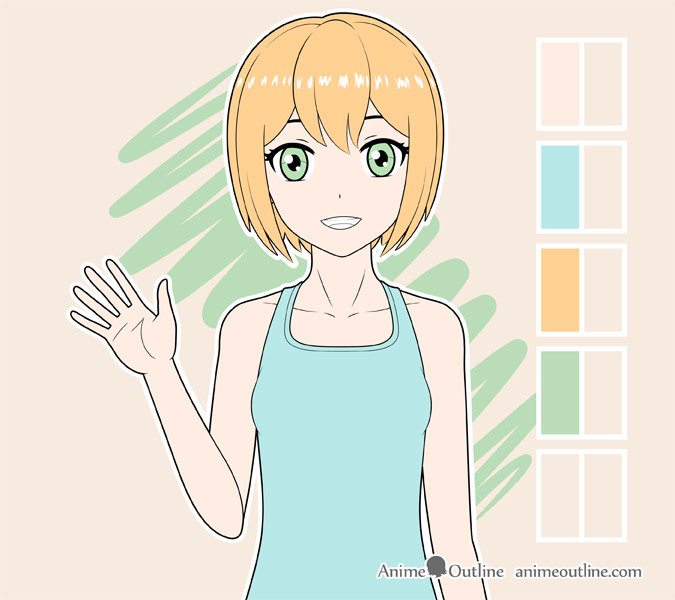 If you are going to be coloring digitally you can add the highlights after you color the entire drawing. Before you can color you should have a nice and clean line drawing of your anime character. 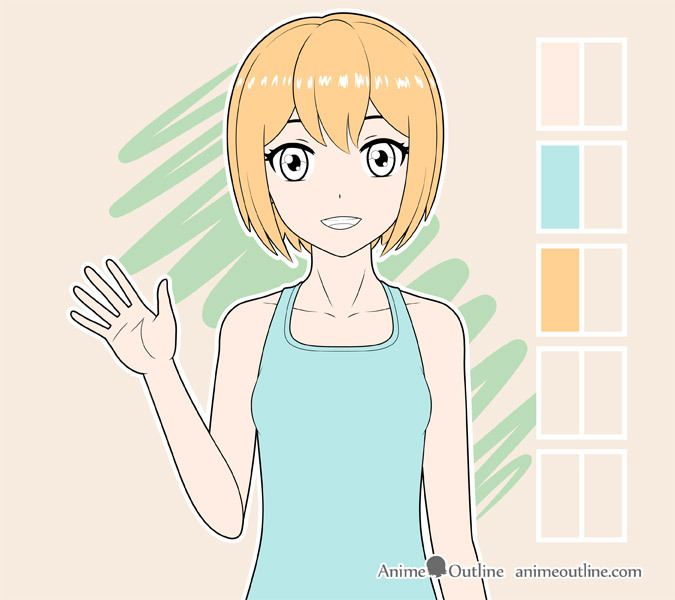 If you need help drawing an anime character you can see the Tutorials section of the site. The first areas you will want to fill in are any parts that will be completely black or basically the same color as the lines in the line drawing. 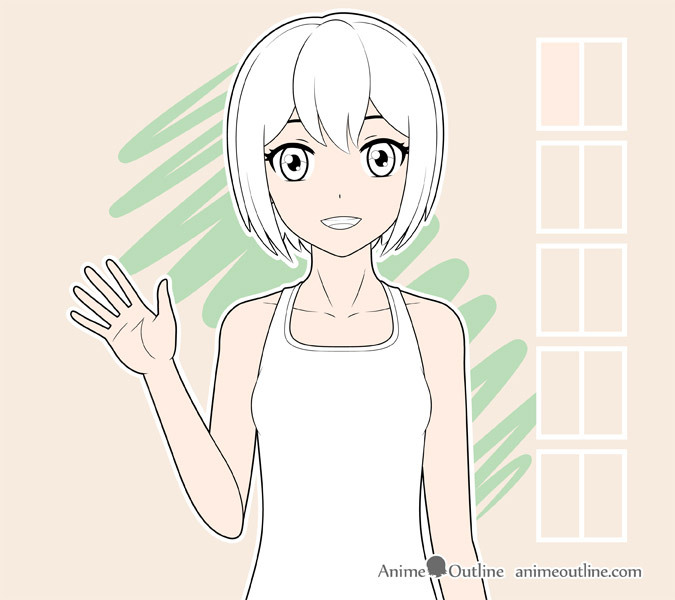 If you are drawing an anime character like the one in the above example the black areas will usually be the eyelashes and pupils of the eyes. Again be sure to leave the reflections white when filling in the pupils if you are drawing on paper. In this case the clothes are just the shirt which. Fill it in with one solid color just like the body. When coloring the hair once again leave the highlight area white if drawing on paper. 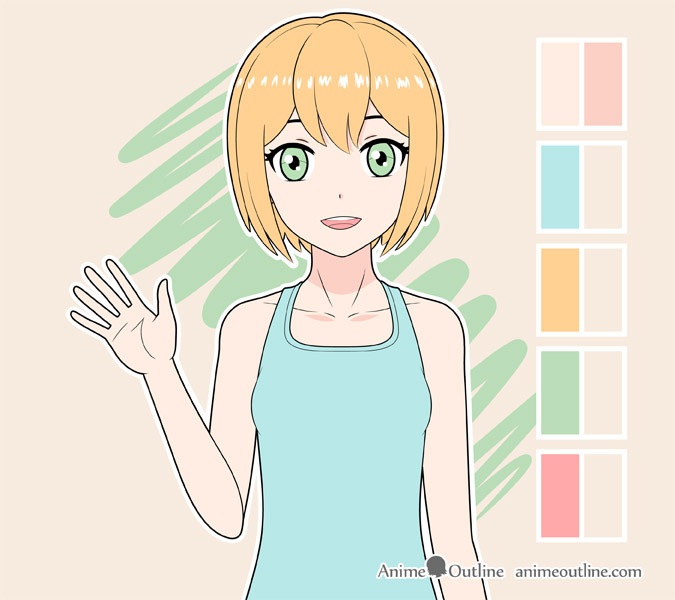 If drawing digitally you can add the highlight in over top of the color. As the pupils will be black simply color in the iris of the eyes. Color in the mouth area excluding the teeth. As the clothing for this example is fairly tight with no folds just add a tiny shadow below the chest area. To again keep the shading to a bare minimum for the hair simply darken the inner area of the back of the hair. Shade in the top of the irises as there will usually be a shadow/reflection there cast by the eyelashes. Finally darken the mouth area excluding the tongue and you should be done. Cell shading can on one hand be easier as it’s fairly basic shading but at the same time it can be difficult to find the right areas to shade. 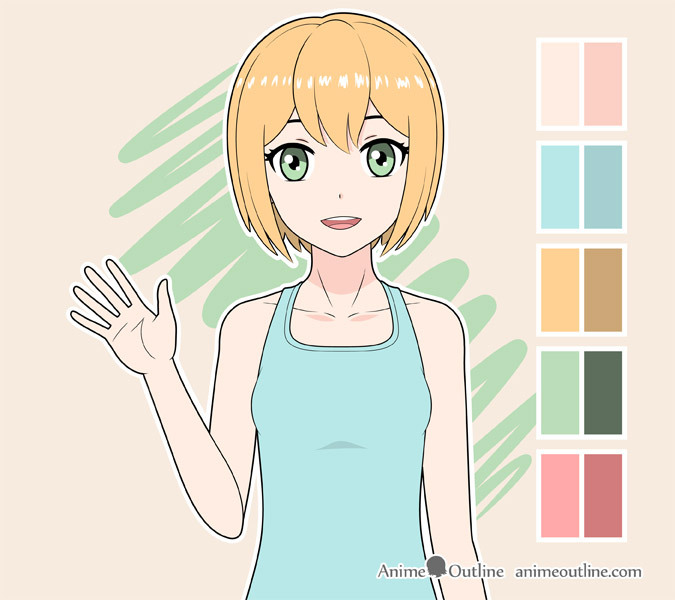 As mentioned before the suggested shading areas in this tutorial will generally be the ones that are darker in most normal conditions but you can certainly experiment with different types of lighting.